For some people, the day after Thanksgiving is the green light to start playing Christmas music, put up the family tree, and decorate the house with jingle bells and wreaths. The entire week after Thanksgiving is the time when we start to transition from autumn to winter. It’s not only the time for trading in our rain boots for snow shoes and pea coats for parkas, but it is also a time to change things up in the kitchen. A new season means new ingredients and flavors. 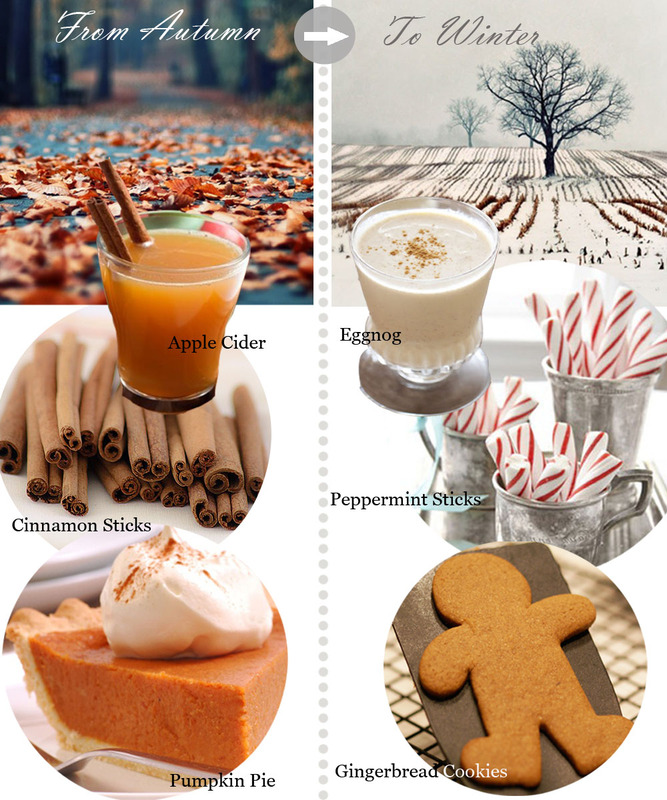 With winter comes seasonal delights such as gingerbread cookies, eggnog, and peppermint. So enjoy the last of those cinnamon sticks and pumpkin pies for one more week because in just a couple of days, it’ll be time to celebrate the winter season! On Saturday, fall officially begins. My countdown for fall has been ticking for a while now, and I am so excited to be in the final countdown. Even though I have already been in the fall mindset, it’s always nice for it to be legitimate. 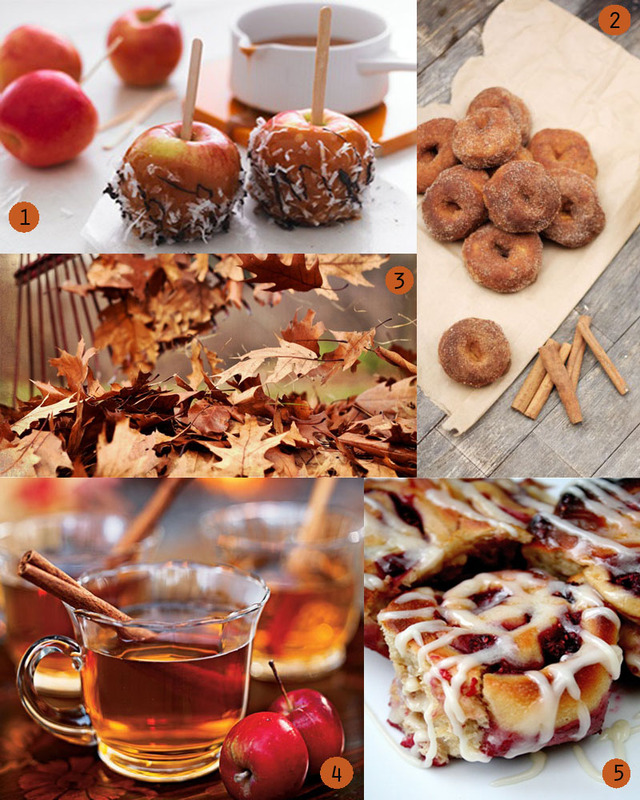 My food mood board is currently full of warm colors: orange, red, yellow, brown. I can’t wait to get back in the kitchen to start baking delicious, gooey pastries that perfectly accompany a big mug of apple cider. 1: Caramel Apples with Coconut & Chocolate Drizzle – caramel apples are perfect for this time of year! 2: Baked Pumpkin Autumn Maple Doughnuts – I could eat this for breakfast every morning. With #4. 3: Crunchy leaves – what is fall without them? 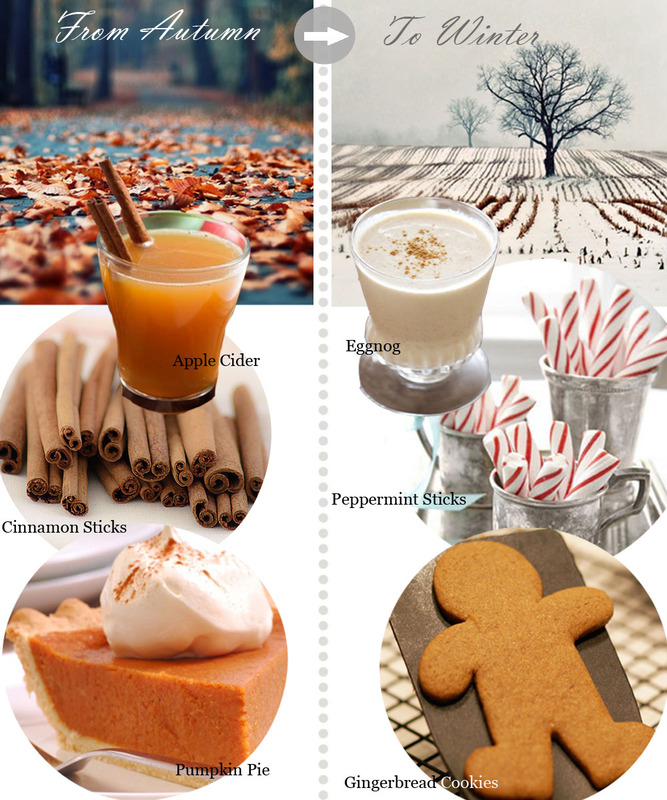 4: Apple Cider – the cinnamon stir sticks add a delicious warmth to the drink. 5: Raspberry Swirl Sweet Rolls – warm rolls on a crisp morning, get in my life.